Researchers at at the Peter Doherty Institute for Infection and Immunity in Melbourne and the Kirby Institute, together with international scientific collaborators from 22 institutions, have announced a joint initiative to accelerate the search for an effective HIV vaccine. 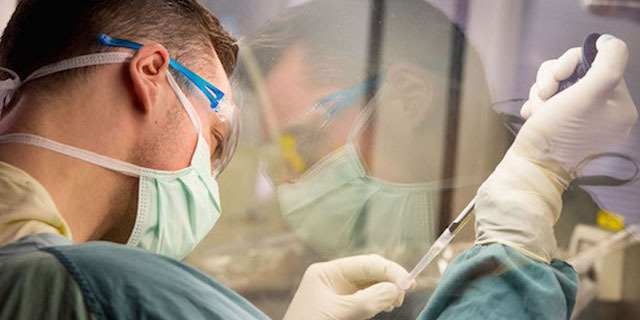 Funded by the European Commission, the European AIDS Vaccine Initiative (EAVI2020) brings together a multidisciplinary team of leading HIV researchers from public organisations and biotech companies from across Europe, Australia, Canada and the USA in a focused effort to develop protective and therapeutic HIV vaccines. "Great advances in science and medicine all need teamwork," said University of Melbourne Professor Sharon Lewin, Director of the Doherty Institute. "This collaboration will allow us to work with the best people, using the best technologies to build on the enormous scientific progress that has been gleaned over the last few years. "We'll be taking the latest discoveries from the lab through to preclinical testing and manufacture and into early human trials more quickly than we could ever do in isolation from each other." The Kirby Institute's Professors David Cooper, Anthony Kelleher and Miles Davenport are part of the Australian contingent, alongside University of Melbourne Professors Damian Purcell and Stephen Kent from the Doherty Institute, all of who are currently working on creating an effective HIV vaccine in their own laboratories. "Since the early days of the HIV epidemic, our Australian research community has been at the vanguard of scientific discoveries that have had global implications for the way we prevent HIV and how we diagnose and treat people living with HIV. But despite the tremendous successes we've seen, an effective vaccine still remains elusive," said Professor Anthony Kelleher from the Kirby Institute. "This project creates a unique opportunity for us to pool the knowledge and expertise of the top minds in HIV research to move much more quickly towards that goal." According to the World Health Organization, around 35 million people were living with HIV at the end of 2013. More than two million people are newly infected every year, and it is estimated around 22 billion US dollars is spent annually on HIV treatment and care. Although researchers have been working on developing a vaccine for 30 years, recent advances are helping to speed up their quest. Scientists have isolated antibodies that are able to block HIV infection in preclinical models, and there have been new developments in using synthetic biology to design better vaccines.